Moving vehicles enhance mixing processes by inducing turbulence, which originates from the interaction between moving vehicles and ambient air. The wakes behind moving vehicles are characterized as momentum wakes and contain organized trailing vortices which play a key role in determining the flux of kinetic energy and rapidly mix the pollutants released in the turbulent wake. VIT, which is strongly related to vehicle type and speed, can be expected to significantly influence the diffusion of roadway emissions, especially in the microenvironment near roadways. 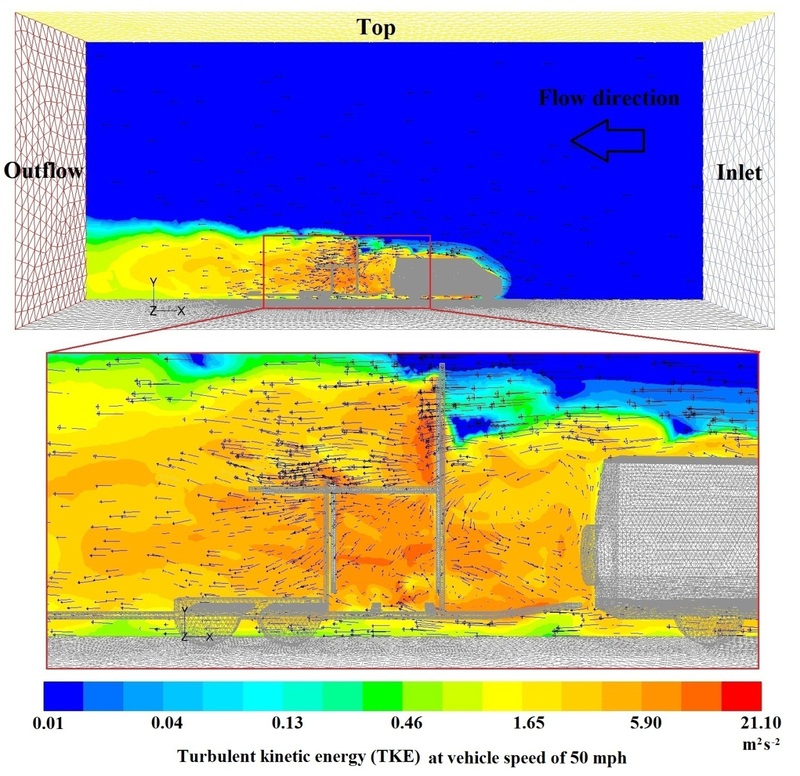 We modeled the turbulent flow field behind a single vehicle by CTAG, which is evaluated by turbulence measurement in vehicle wakes . In the field measurement, 3-D sonic anemometers were installed on an adjustable pipe scaffolding on an open platform trailer, which was towed by a full-sized van moving on a 1524 m long airport runway at Rockwood, TN . The movement of on-road vehicles results in a significant increase in VIT, which remains at a high level surrounding the vehicles and in the near wake of the vehicles. But due to dissipation of turbulence, VIT decays rapidly with the increasing distance away from the vehicles. VIT is strongly related to vehicle types and speed. The heavy-duty diesel trucks induce more turbulence than passenger cars due to its size and structure.